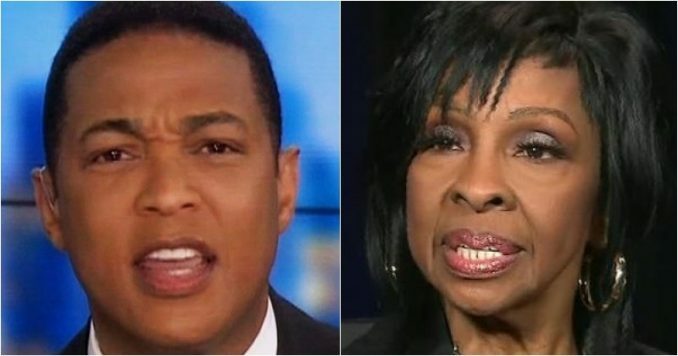 CNN’s Don Lemon was angry that the legendary Gladys Knight sang the National Anthem at the Super Bowl. Lemon was really perturbed that the African-American icon would bypass the “Colin Kaepernick” boycott of the event by celebrities and sing one of our nation’s most patriotic songs. Well, Gladys really loves America, and she utterly destroyed the Trump-hater. You’ll love this. CNN isn’t pleased with this Gladys Knight interview. The 74-year-old Grammy winner schooled Mr. Lemon about patriotism, and he didn’t like it one bit. Many Americans are boycotting the NFL, but as the Super Bowl must go on, so must the singing of the National Anthem. So when Gladys Knight was offered the big job, knowing that many performers had publicly stated they were boycotting the event for Trump-hater Colin Kaepernick, she didn’t hesitate to grab the chance. “The US Super Bowl halftime show, one of pop music’s most visible gigs, this year went from highly coveted to largely unwanted, leaving the NFL scrambling for takers as a cultural firestorm over social justice rages,” Breitbart reported. Prominent artists including Rihanna, P!nk and Cardi B reportedly turned down the offer to headline Sunday’s championship game between the New England Patriots and Los Angeles Rams, amid the controversy over racially charged police brutality protests spearheaded by former San Francisco 49ers quarterback Colin Kaepernick, Breitbart added. So in a strange turn of events, the boycotting which was started by patriotic Americans angry the NFL was allowing players to “take a knee” during the National Anthem, morphed into these entitled celebrities boycotting over their hero Colin Kaepernick. And that so-called outrage by celebrities fueled CNN’s Don Lemon’s grilling of Gladys Knight. Lemon starts off by showing Ms. Knight a clip of high-powered Hollywood attorney Mark Geragos, who is now representing Colin Kaepernick. Geragos clientele includes Wynonna Rider, Micheal Jackson, and convicted wife murderer Scott Peterson. Then, that weasel Lemon tried to scare Knight by relaying a story about the president’s inauguration, saying singer “Chrisette Michele lost her career for singing” the National Anthem. The truth is that Spike Lee nixed the idea of using one of her songs in his new Netflix series. She got backlash from those who run around saying “No Justice No Peace” and claim to be so tolerant. Poor Don Lemon hated the interview. He sat there looking pouty and pissed off that the Motown legend seemed a bit shocked that singing the National Anthem is now controversial. And who could blame her? Thanks to Colin Kaepernick and every idiot celebrity who supports him, our beloved National Anthem is under attack. And it’s shameful. The song is based on a poem by Francis Scott Key who watched through the night as Fort M’Henry was bombarded by British ships during the War of 1812. Key was in awe as he spotted the large American flag through the haze the next morning. The flying flag indicated the Americans had been victorious. And now, in 2019, this beautiful song has somehow become “politically incorrect” by the Hollywood crowd and their cohorts. It’s ridiculous. Gladys Knight stood up to the leftist mob. Our National Anthem should always be a source of pride and inspiration. It should always garner every American’s utmost respect whenever and by whoever decides to perform it.